Fires Across California Force Evacuations, Claim Homes And At Least One Life Multiple counties have ordered evacuations as crews work to contain fires across the state. The Klamathon Fire burns this week in Hornbrook, Calif., just south of the Oregon border. At least one person was killed in the fire. Evacuations have been ordered in parts of San Bernardino County because of multiple fast-moving fires in the San Bernardino National Forest. According to an incident report from the U.S. Forest Service, the Valley Fire started Friday afternoon and quickly grew to 1,000 acres by 8 that night. "We have roughly about 500 firefighters assigned, and we have more coming in today, including an incident management team," says Lee Beyer, a public information officer with the U.S. Forest Service. He says that as of Saturday morning, the fire seems to be moving away from homes and other structures. "Officials described a chaotic scene as the fire burst out of control around 8:40 p.m., catching some residents off guard. County 911 lines were jammed with calls, and emergency officials said they contacted 1,200 lines to urge evacuations." Gov. Jerry Brown has declared a state of emergency in San Diego County, where fires have burned homes, damaged infrastructure and forced evacuations. On Saturday morning, Cal Fire San Diego tweeted that firefighters continue to make progress and that containment has risen to 30 percent. In Northern California, at least one person has died in the Klamathon Fire, which began near the Oregon border. A situation summary from Cal Fire Saturday morning noted "extreme fire behavior with movement in multiple directions." The fire has grown to cover more than 21,000 acres. Record-breaking heat contributed to the danger this past week. The National Weather Service is warning of temperatures as high as 110 degrees for Saturday in certain counties. 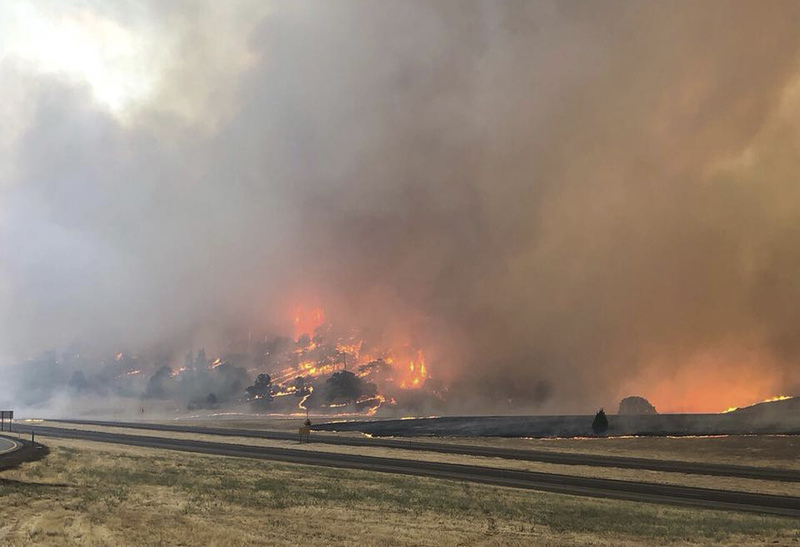 The high temperatures and low humidity, as well as gusty winds, create conditions in which fires can "grow rapidly in size and intensity," a National Weather Service alert cautions. "It's going to be a long fire season," Lee Beyer with the U.S. Forest Service says, noting the dry winter and near-drought conditions in much of the western U.S.
"Folks certainly should be aware of fires around them and what's going on," he adds. "Have an evacuation plan in place, because sometimes you only get 10 minutes' notice that you need to leave an area." The current heat wave has also prompted health concerns in Southern California especially, even for those not affected by the wildfires. Los Angeles Mayor Eric Garcetti issued a statement on Thursday urging residents to take advantage of cooling centers throughout the city if they don't have access to air conditioning. "Extreme heat can be dangerous — especially for young people and seniors," said Garcetti in the statement. "When temperatures rise this high, our libraries, recreation centers and senior centers give Angelenos who need to escape the heat a friendly, welcoming, safe place to stay cool and healthy."